The Huff Run Watershed Restoration Project (HRWRP) is holding two Huff Run Awareness days, May 4 and May 11. HRWRP needs skilled volunteers to help out with a macro-invertebrate lesson, macro helper, acid mine drainage chemistry (2 volunteers), electro fishing helper, and a site tour helper. We would really appreciate your help. For more info, contact: Terri Sponaugle-Schrock, terri@ruralaction.org. Rural Action is now accepting submissions for t-shirt designs. All artistic styles will be considered. Possible themes include: healthy forests, clean streams, young people or sustainability. 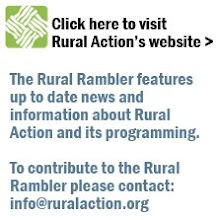 Check out our website (http://www.ruralaction.org ) for more ideas. Submissions are due March 22, 2006, by 5 p.m. They may be dropped off at Rural Action’s Trimble office or e-mailed to stephanie@ruralaction.org.